Understanding investment risk and your personal risk tolerance is key to successful investing. 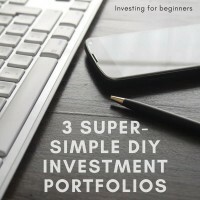 Today we’ll visit both of those items to help you make intelligent investment decisions that are best for you. The risk factors of investing are very often misunderstood. Consider this situation to highlight how most people think of risk: Warren Buffett’s net worth dropped over $20 billion dollars through the Great Recession. Question: How much money did Warren Buffett lose during the Great Recession? Answer: He didn’t lose any money because he didn’t sell. Today his net worth is much higher than it was before the start of the Great Recession. What many people consider the biggest risk of investing is actually volatility. Volatility is when markets move – up or down. And that happens all the time. A market correction is defined by the value of the stocks as a whole drop 10% or more from a recent peak. This happens every 3-5 years on average. 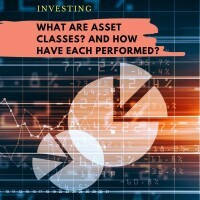 It’s a normal occurence that anyone interested in investing should understand. If you have a long investing timeline – say 20 years or more – you shouldn’t care about volatility. Actually, that’s not quite right. You should care. You should care because if you are investing consistently, every time market prices drop you get to buy your shares at a discount! On the other hand, if your investing timeline is shorter, then market volatility does turn into a risk factor. The average market correction lasts less than two years. A couple of corrections in the past have lasted longer though. That’s the danger of just considering averages. If you are retiring within a couple of years and the market drops by 30%, it could impact your retirement goal. That’s why most financial advisors recommend clients consider shifting some money into less-volatile bonds as they get closer to retirement. Perhaps the second most important risk factor to consider, yet often ignored, is purchasing power risk. This is more commonly just referred to as inflation. The United States has seen historic inflation rates average between 2 and 3% annually. That means that every year – on average – prices increase by 2-3%. 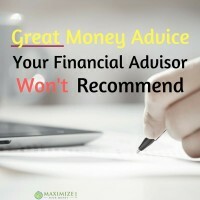 If you are not investing, but instead have your money in a bank savings account, you are effectively losing money. Because of inflation, your $1,000 today might only purchase $750 worth of goods in the future. Along the same lines, a household budget of $50,000 today might cost $75,000 by the time you retire. That needs to be considered in your investment planning. 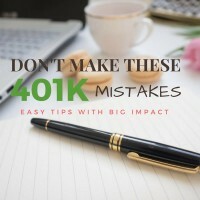 Ignoring this risk can derail your big financial goals. 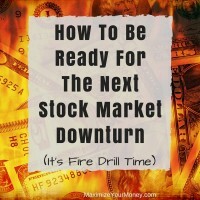 The answers include sell everything, sell some of the investments, do nothing, or buy more. Selling – unless you had a critical need for the money – would of course be a low-tolerance answer. The “best” answer would be to do nothing – stick with the plan unless you actually need the money right away. Here’s an interesting chart I found over on the Fidelity site. As you can see – and so many financial experts like to say – “the market” has returned right around 10% per year on average. 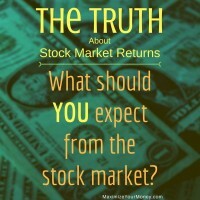 Of course “the market” means 100% stocks, so the returns have also been the most volatile short term. Look at the 25% bond portfolio mix though. It has returned almost 9% per year annually – just 1.13% less per year than a total stock portfolio. Yet in exchange for that approximate 1% difference, worst year loss improves 22%! Now look at the 40% bond portfolio mix. In that scenario you would sacrifice 2.09% annually on returns but improve upon the worst year performance by 40%. Of course watching your portfolio balance drop by 40.64% can create some emotional turmoil. But it’s a lot better than watching it drop an additional 27%! What Risk Level Can You Afford? A CFP friend recently told me that there were three things to consider with risk tolerance. 1. What risk can you withstand. That’s similar to the questions that Vanguard asks in their questionnaire. Can you stay strong when things look rough? 2. What risk do you need to withstand. 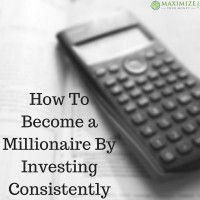 This comes down to what level of returns you need to meet your goals. You might want ultra-conservative investments but need a higher return than it provides. This factor definitely needs to be considered. Missing your goal because you wanted to minimize risk is a serious situation. 3. What risk do you want to withstand. I hadn’t considered this before. My wife and I are fairly risk tolerant. But we also don’t need to take a lot of risk to achieve our goals. So it comes down to what level of risk we want to take on. More risk means we’ll likely have more money later. Less risk means we’ll have less money – but still enough to achieve our goals. Interesting to consider for sure. Because of inflation as noted above, you need to knock at least 2% off annual returns when financial planning. A 10% returns actually looks more like 8% after inflation. Take a look at the chart above again. Can you achieve your financial goals with an inflation-adjusted return of 5.93%? If so, then a 60/40 stock/bond mix portfolio might be perfect for you. If you need a higher return than that, then you’ll need to consider a higher volatility portfolio. Of course because long timelines tend to lower risk, many people start out with very aggressive portfolios – sometimes 100% stocks. This gives the best returns on the investments over a long period of time. Once the investor gets closer to the time that they’ll need to access the money, they often shift into a more conservative mix. At that point they sacrifice potential returns, but lower their volatility. As long as someone doesn’t shift too conservative too early, this can often work out perfectly to achieve investment goals. What risk level can you stand? High, average, or low? What risk level do you need to achieve your goals? High, average, or low? What risk level would you prefer if the choice was wide open to you? Great post! Knowing your risk tolerance and being able to sit still (or take advantage) of a recession is hard. Done it a couple times and it is uncomfortable. But as you said, it is also a chance to get some funds “on sale” as well as rebalance if your tolerance/allocation was out of whack. That Fidelity chart is pretty interesting! Because I’m retired and my opportunities for additional income are limited, my risk tolerance is fairly low. I’m not naturally a risk taker anyway. However, my wife’s risk tolerance is higher because she is still 20 years away from retirement. I thought so too Gary. Now that we’re retired there are more thoughts about risk – specifically sequence of returns risk. Thanks for stopping by! I find these risk tolerance questions fascinating in that many people end up choosing an allocation that’s not mathematically ideal for their circumstances. My plan to stick with my planned asset allocation is to try and ignore the daily market movements as much as possible. Thanks for stopping by Jason! Yeah, it’s a tricky balance between the needed returns and acceptable levels of risk. Ignoring market moves is a GREAT idea for someone with a long investing timeline. Nice detailed article on Risk and Risk Tolerance.